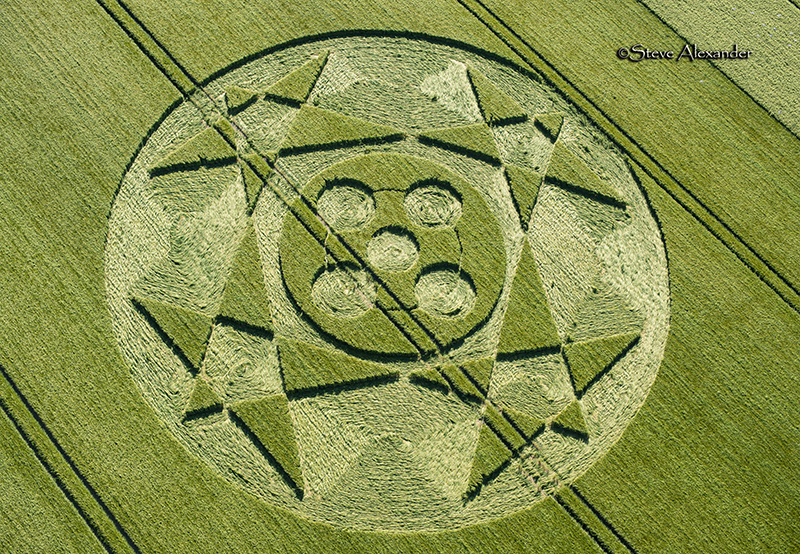 Details: This circle was reported on Saturday the 9th of June. 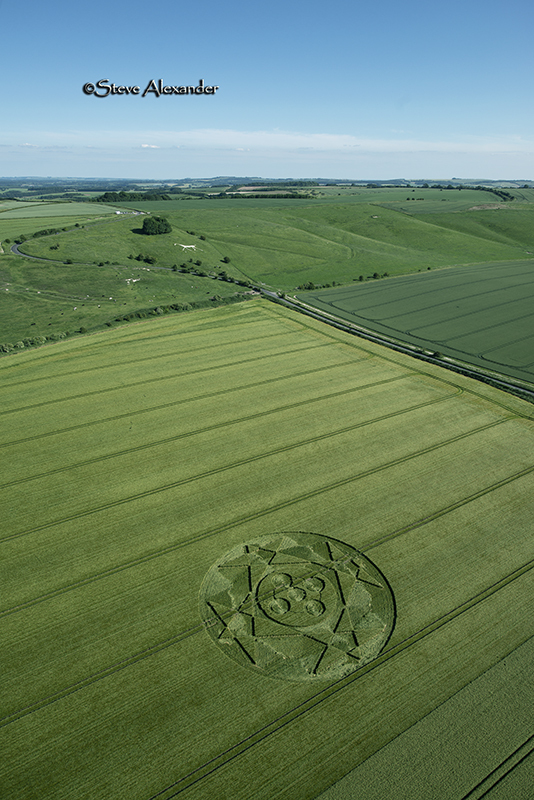 It lies in a field of barley close to the chalk white horse on Hackpen Hill and measures approximately 180ft in diameter. 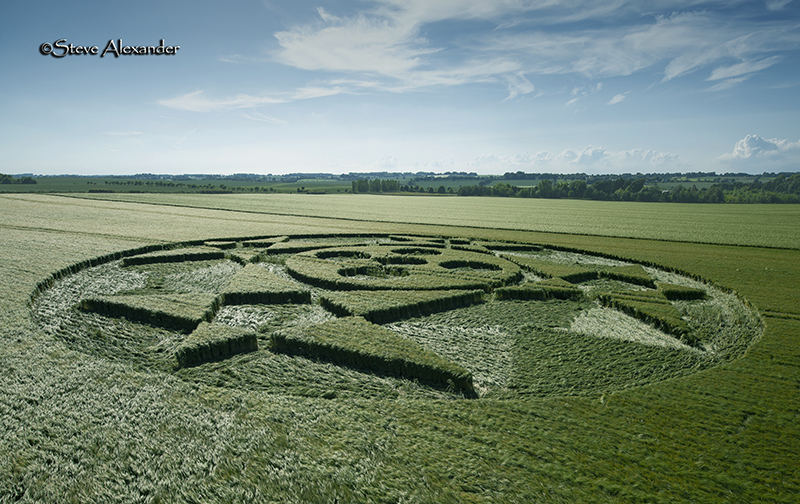 Visiting: This circle will be open to the public from Thursday the 14th of June. 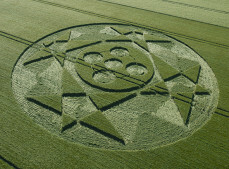 Please do not enter the field before then. 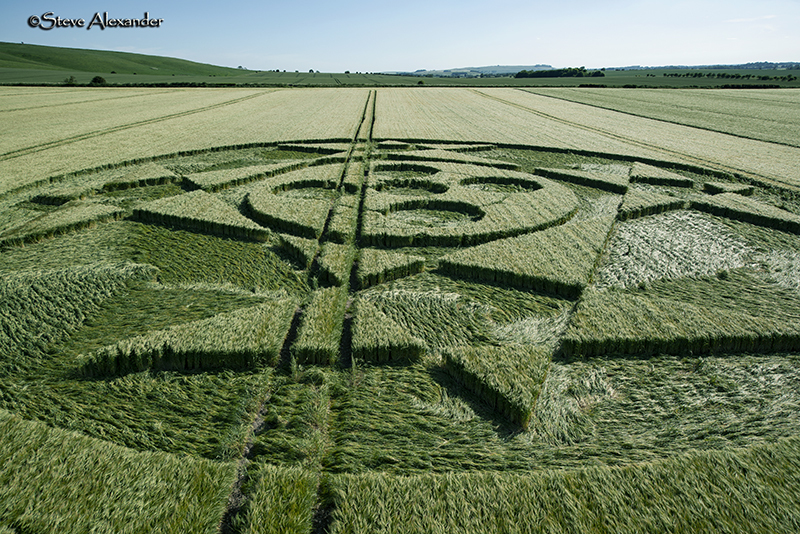 This crop is a first crop from a new seed and needs to be properly managed and protected. 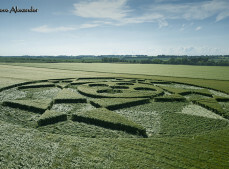 It’s fantastic news that the farmer is opening his field. 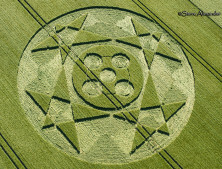 There will be a small charge with all monies going to a local cancer charity. 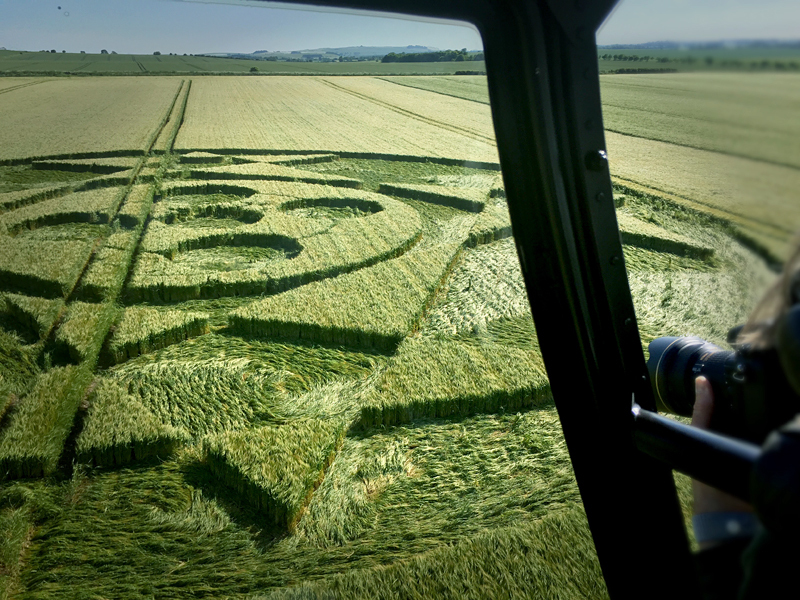 Please, please respect the farmers wishes – thank you. 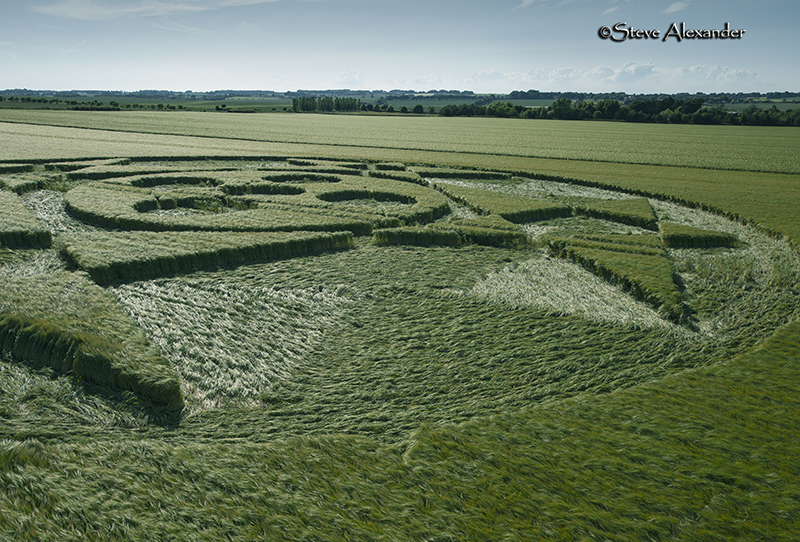 Visiting Update: This crop circle has now been harvested. 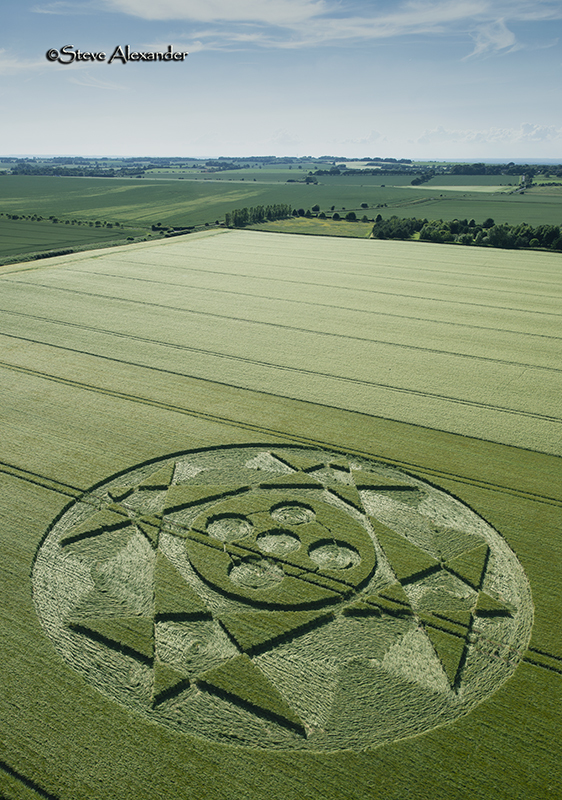 Location: Hackpen Hill is a regular site for crop circles and many have been seen here over the years. 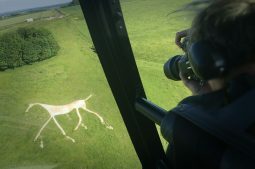 They do not always occur in the same field every year, sometimes they appear at the top of the hill by the ancient Ridgeway path that connects Hackpen, Avebury and onto Barbury Castle. 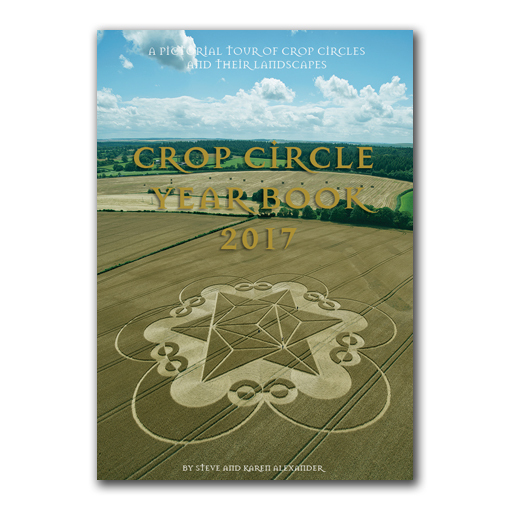 However, this field did have a circle in 2017. 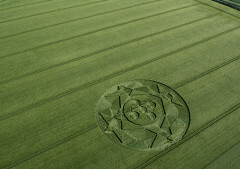 The nearby Hackpen White Horse was cut to commemorate the coronation of Queen Victoria in 1838. 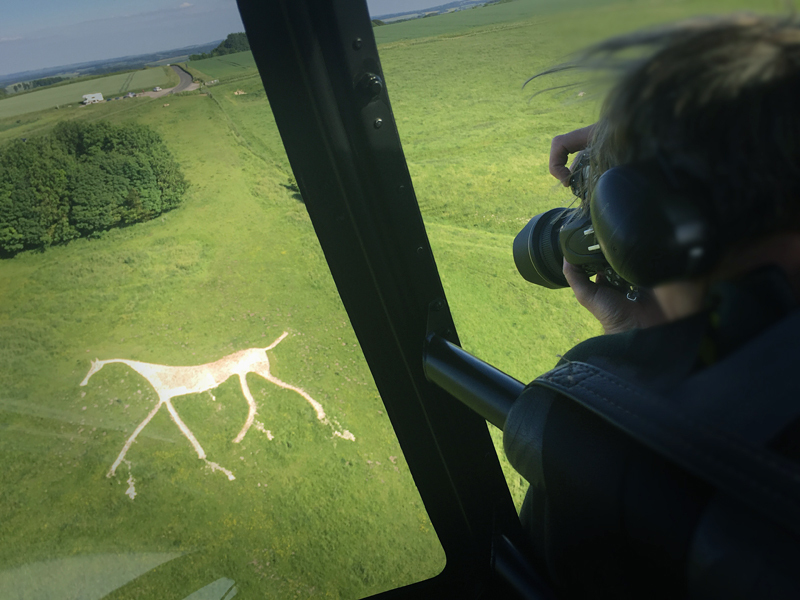 Although little is known about the origins of the horse it is believed to have been cut by Henry Eatwell, parish clerk of Broad Hinton and also the local publican. 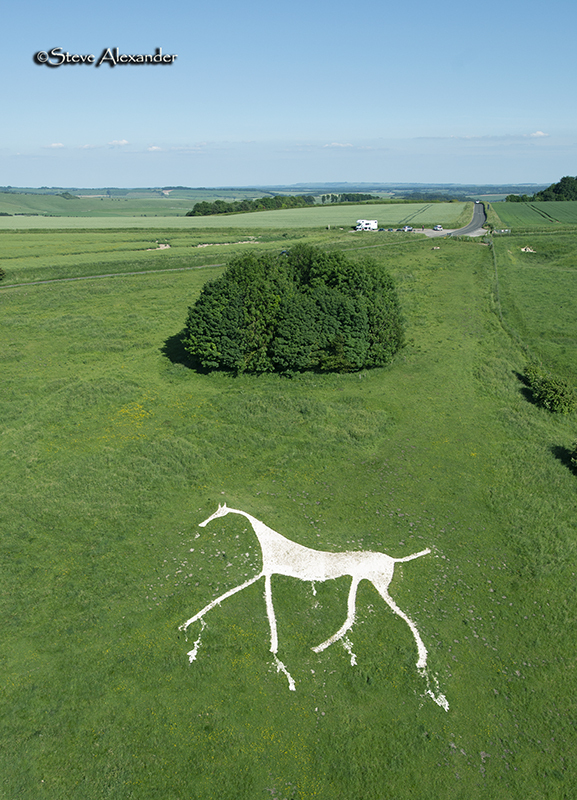 The horse measures 90ft by 90ft and is best viewed from the A361 at Broad Hinton. 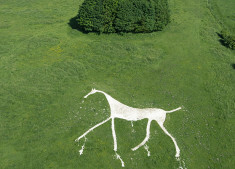 You can read more about the horse here. 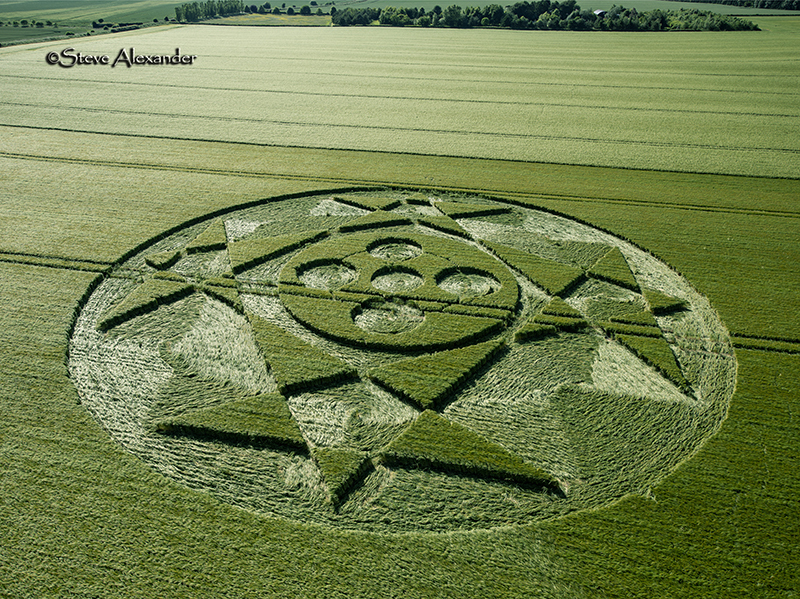 Design & Symbolism: The design of this formation bears a close resemblance to the formation at the Rollright Stones at the end of last season (2017 – see here). 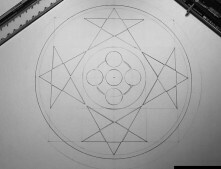 The stretched pentagrams and the marriage of four (square) and five (pentagram stars) is definitely a variation on the same theme. 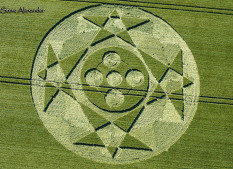 The 2017 Rollrights formation was a really innovative solution for marrying four and five-fold geometry – it was commented upon by several geometers I know. 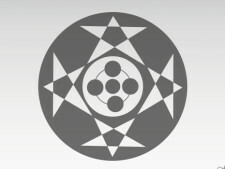 Unlike at the Rollrights where the geometry and symmetry were accurate, here there is a clear asymmetry to the design, with two of the stars having one elongated point. 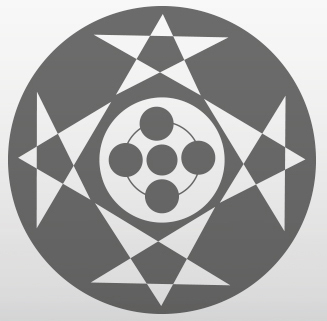 The central circle has a quintuplet of circles that are connected by a thin ring, once again the symmetry is not accurate, consequently the whole design looks slightly off-centre and distorted. 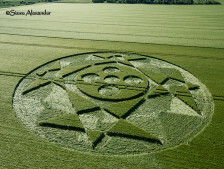 We have encountered asymmetry in crop circle design before, and while some will automatically see this as a sign of inauthenticity, that might be hasty and it will be interesting to see what the circle is like inside before making any judgements about it. 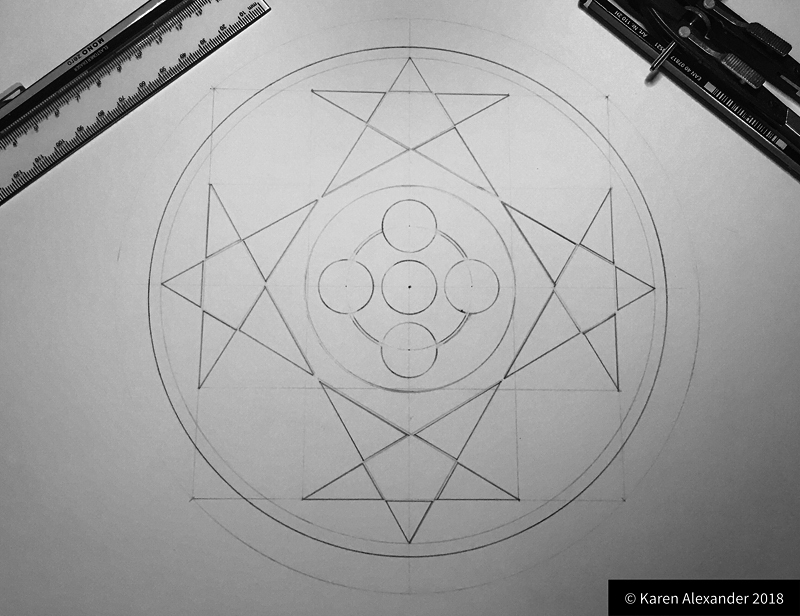 When presented with a circle such as this, it’s important to keep everything on the table and to be open minded – one thing that is for sure – that without asymmetry, we would have no clear understanding of symmetry at all. 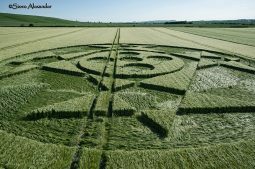 We could of course be being asked to think about the role of both symmetry and asymmetry, not just in crop circles, but in a wider context. 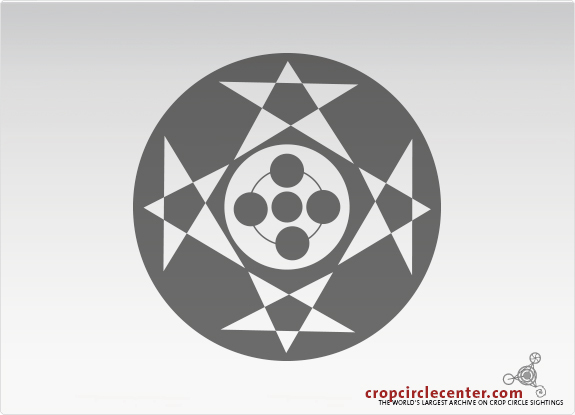 The role of that which in balances is fundamental in the propagation and evolution of all things. 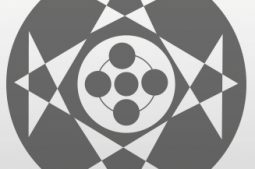 There are times and circumstances when things can be too perfect and this leads to stagnation and no growth or evolution, sometimes it takes a little imperfection, or mutation to take things on to a new level. 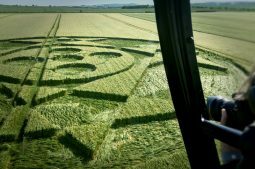 It almost makes you wonder that in all their glorious perfection, even now and again, the crop circles need a little asymmetry to evolve themselves! 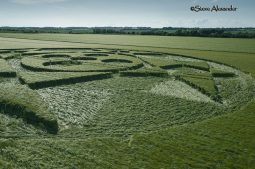 How do you solve a problem like Hackpen Hill? 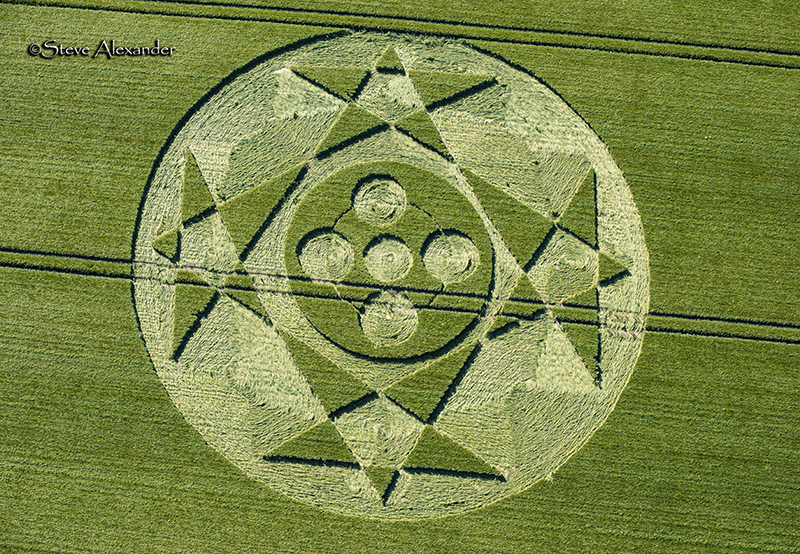 So, I have been looking, staring and otherwise contemplating the crop circle at Hackpen Hill. 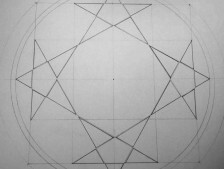 How does one approach this from the perspective of a geometer? 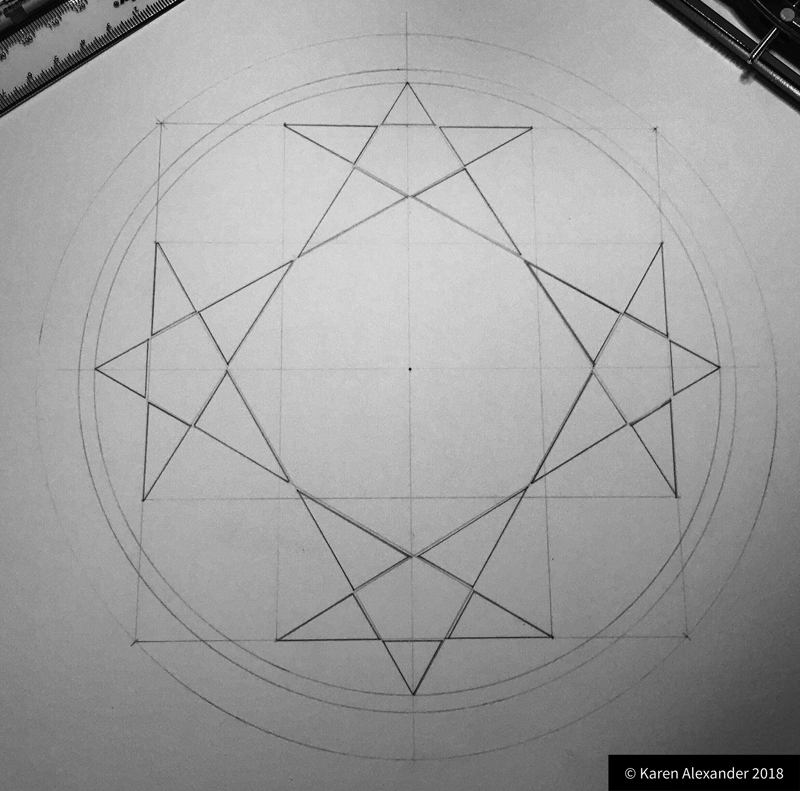 Does one try to make an exact copy of what was in the field (in the light of its asymmetry), or does one go the route of attempting to bring the design into symmetry in the hope of understanding it a little better?